"Someone is speaking well of you at this very moment." I love fortune cookies. They make me feel like a child hoping I'll get a good fortune that will come true. Each New Year's Eve, I pass around fortune cookies to everyone at the table, and we all read them out to each other, always adding "in bed" at the end and giggling like teenagers. "You will inherit a large sum of money." One year, I cracked opened my fortune cookie and it was empty. It turned out to be a tough year! This year, the fortune cookies I bought were dipped in white chocolate and all contained two or three fortunes in each. Before photographing this cake I noticed there was one fortune cookie remaining in the container on the counter from the holidays. And since it was Chinese New Year yesterday, I cracked it open to find four fortunes! "Someone is watching you from afar." I baked this cake in my cast iron pan that I found several years ago at a garage sale where a retired foodie was selling many of his prized cooking items. This was a great buy since I've used it often, but never for something sweet. Now I have a list of treats I want to bake up in my pan. You can find the recipe for Fresh Ginger and Chocolate Gingerbread in the book Baking: From My Home to Yours by Dorie Greenspan or here. Dorie also wrote about this cake on Serious Eats and on her blog she recommends freezing this cake to have on hand. To see how the rest of the TWD group fared with this week's recipe, click here and then click on each blogger! Thanks to Heather of Sherry Trifle who chose the recipe for this week and will post the recipe. I love ginger, and I love chocolate. Together, the taste was interesting. The cake was moist and the stem ginger added a little zing to some bites. Although it's not my favorite cake, it was fun to use my cast iron pan in this way. And Dorie says this cake freezes well, iced and all. So, I'll probably pop half of it in the freezer to pull out and share with friends and family. "You tend to think things out thoroughly and seriously. World Peace Cookies on pages 138-139 chosen by Jessica of cookbookhabit. It looks great! I love that you baked in in the cast iron skillet! How fun! What a gem of a yard sale. That cake is beautiful. Beautiful cake - I love that you made it in a cast-iron pan! The cake looks lovely! What a great idea to use the skillet for this! I have a 9-incher that I use for baking certain things and I love the way they turn out. Cute little pan. Our never made it to the freezer. I love your cast iron skillet. Ciao ! I wish there were such a nice thing as garage sale around here ! Your gingerbread is great ! What a great idea! It looks beautiful, as always! how cute! i love my cast iron skillet..so useful. wow, where do you find chocolate dipped fortune cookies with multiple fortunes in them? i love reading the fortunes! and your cake looks ridiculously amazing, as usual! What a great way to use your cast iron pan! You are so creative week in and week out! How clever. I heard buying second hand cast iron it the best way to go. I am going to try to find me one like yours. I grew up around big, heavy-duty black cast iron skillets. Did you have to use a cover? Amazing job! That looks wonderful. I have a pan just like that but am new at using it. 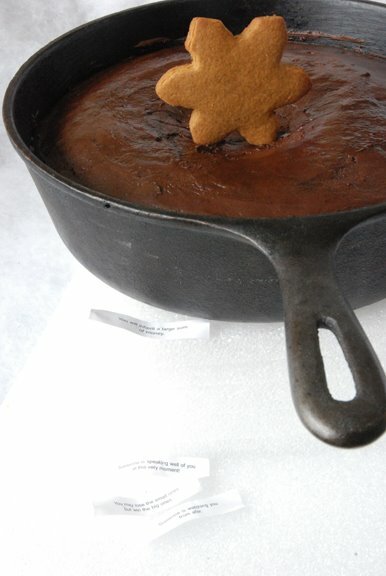 I never would have thought to put my gingerbread in it. 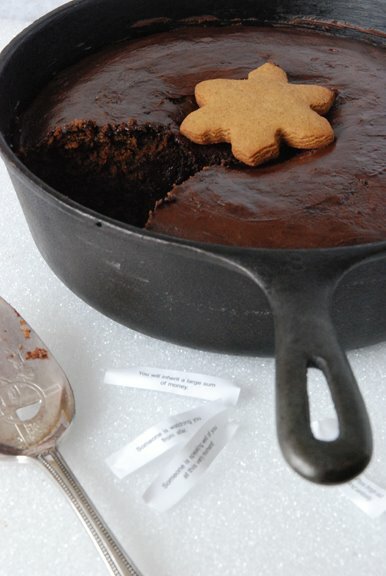 I love that you made the gingerbread in your cast iron pan. Your cake looks gorgeous. This cake does look just great! Chocolate and ginger sound like an awesome combo, especially in a cookie or crust. We'd love to give it a try in this cake. So, how badly did it stick?! Jodie - I've never done that before, but it worked! Rainbowbrown - It was a steal. I can't remember how much I paid for it, but it wasn't much. Sticky... - Hope your ankle heals fast! Jules - You've got some gingerbread and chocolate fans at your house! natalia - You should start a new trend! Steph - I have more ideas now than ever. dessertobsessed - I found them at Winners, of all places! Teanna - Thanks! You're so sweet! Gabe's Girl - No, I didn't use a cover. Buying second hand means it's been extra loved! Secret Server - Hope you give it a try! duodishes - Hope you do! Ben - Actually it didn't stick. I lined the pan beforehand with parchment paper. I guess I should have mentioned that somewhere in the post. This is a perfect cake for cast iron baking. Great idea. Interesting way to bake this...I would never have thought to do something like that with the cast iron pan, etc. It looks lovely. Great post and photos, as always! That looks perfectly gorgeous I must say! Really beautiful. I love the little pan. I love baking my cast iron too. The chocolate and ginger sounds like a wonderful combination to me. The cast iron skillet is fabulous! I love baking in cast iron, it just turns out so beautifully, and you don't even need a serving plate. Great idea! I LOVE how you tied your post in with fortunes and the New Year! I just LOVE that! You did a beautiful job on your cake and I love the little snowflake cookie! Too cute! Wow, I never would have thought to make this in a cast iron skillet! Great idea! Great idea to use a cast iron pan, I should use mine more often! The cake turned out really nice. I loved this recipe and the flavor and scent while baking was great. 4 fortunes in one cookie? It's going to be a banner year for you! So wonderful! What a great find...I dream of finding that garage sale! Your cake looks fantastic - thanks for sharing your fortunes too. You'll have a great year! I never would have thought to bake this in a cast iron pan - you are a goddess of creativity! Look so pretty! I've never had choc with ginger before...interesting. how fun! would never have thought of *baking* n cast iron aside from corn bread....or would that be a johnnycake then? hmmmm either way ginger + chocolate sounds lovley! it's so weird to get a fortune cookie with no fortune in it. that happened to me once. i need a cast iron skillet. your gingerbread looks great. I love the fortune cookie story! And I love your photo of the gingerbread. I made the same thing a few months ago, and it was delicious. But it was definitely not as pretty as yours! Great job, I love how you used a cast iron pan! I enjoyed this post, Shari! What a great idea to bake this is the cast iron pan -- I need to keep that in mind when I am looking for the right pan size. Your gingerbread looks great. I think that "interesting" sums up the chocolate/gingerbread combo nicely. Here's to much good fortune this year! I always wondered if it was a bad sign if a cookie is empty. This looks like such an interesting cake (both cooking vessel and ingredients). I'm a bit fan of ginger and peppermint, but have never tried ginger and chocolate. Lovely job on this one! Do try the swedish cake of Dorie's in the cast iron. It is DELISH! Clever idea to use the skillet. I use mine for cornbread. Now I will try it with gingerbread. Looks yummy! Ah Shari, Love your sweet little cast iron pan/skillet. All the love in that little vessel just bakes on. Reminds me of an old southern treat to eat. Love it. Cooking it in a cast iron skillet was a brilliant idea! I love my skillets. I have been away for the chinese new year holidays and back to the normal routine today. Hope to catch up on your blog. 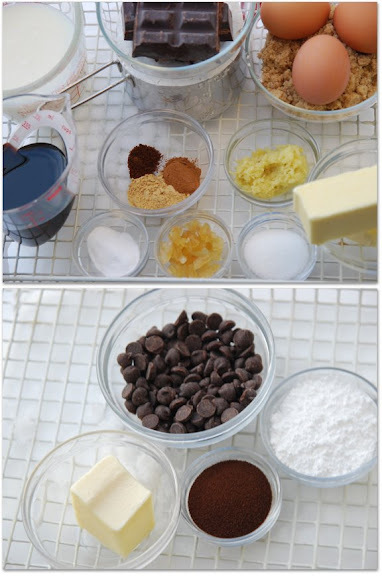 This looks really good - I'm keeping this for the next time I need to make a great dessert!